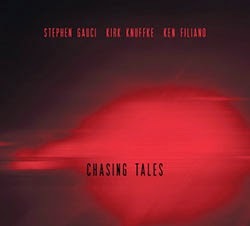 "There's a certain post-bop sensibility to Chasing Tails. The sax, cornet, and bass line up is a bit unusual,” - so far, a little clean up needed but ok, but then - "but you track like ghosting, cheese saxophone play keep a steady pulse”. The aforementioned instrumentation is indeed unusual, but it works quite well. Perhaps it is Filiano’s percussive bass plucking and Knuffke's rhythmic comping on the cornet that keep things bouncing along so well, but right from the first track, “Epee”, where Gauci has a fantastic run on the sax, you know this is a special album. The same can be said for “Ghosting”, the second track, which begins with a delightfully melodic solo from Knuffke. The interplay between cornet and the bass is incredibly precise, and when Gauci joins in and the conversation turns into a dialog between the sax and the bass, things really get cooking. The next track, “Boogaloo", begins with abstract counterpoint between the sax and cornet; however, as 'out' as the music gets, the songs never lose their melodic bearings. The interconnectedness of the three musicians on this album is just great, there's a lot of breathing room in the tunes even as they intertwine quite precisely. Fiiliano's bass playing is exceptional - his pulse, his note choices and his solos are exceptional. The same really could be said for both Knuffke and Gauci, there are no missteps or empty stretches in the music, the ideas just keep coming track after track. Half improvised, half comprised of compositions from the three members, there is a lot to dig into and enjoy here. And indeed, that ghosting saxophone keeps a steady pulse!